Alston Sir Thomas Bart. elder son of Sir Rowland Alston, Bart., M.P., by Elizabeth daughter of Capt. Thomas Reynes; adm., (aged 11) Jan 1735/6; left 1739; Queens Coll. Camb. (adm. fellow com. April 21 1740); Ensign 1st Foot Guards April 16 1741: Lieut and Captain April 23 1743; retired April 11 1745; M.P. for Beds July 1747 - Mar 1761; succ. as 5th baronet Jan 2 1759; m. Aug 30 1750 Catherine daughter of Davis Bovey; d. July 18 1774. Ensign 1st Foot Guards 1741, Capt 1743, retired 1745. This entry in the Alumni appears incorrect as to the lineage. Manor of Molash and all the glebes and tithes of this parish of Molash 1653 belonged to Dudley Palmer Esq. of Grays Inn afterwards belonged to the Meads and from them came to Sir Thos. Alston Bart. of Odell in Bedfordshire who lately died in possession of it. On 5 Aug. 1753 Philip Yorke (q.v.) wrote to Lord Hardwicke about Alston, who had been for a short time in a madhouse. Sir Rowland Alston is very desirous that his son should come in again for the county. If the young man is in any tolerable state of sanity, I do not see any other choice can be made in order to keep up the Whig interest here. His re-election in 1754 was unopposed, and he was classed by Dupplin as an Opposition Whig connected with the Duke of Bedford. 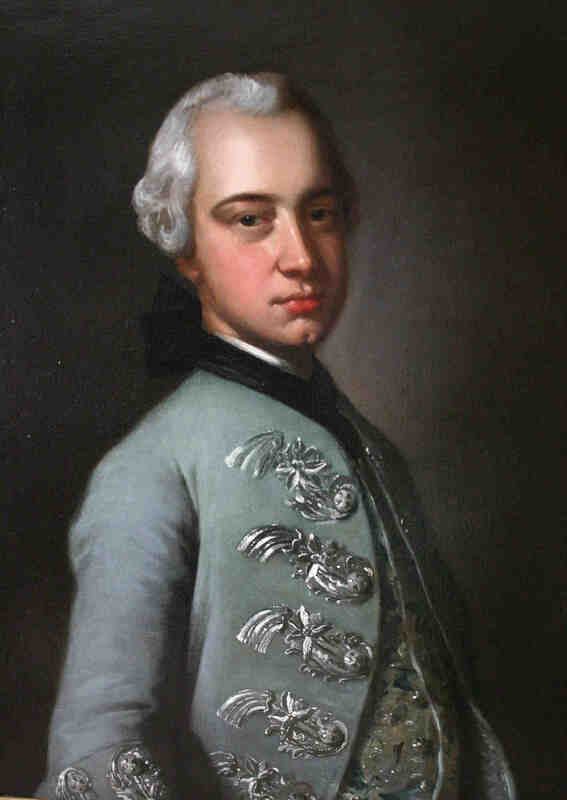 On 15 Nov. 1755 Horace Walpole, writing to Henry Seymour Conway of the debate on the subsidy treaties with Hesse and Russia, noted 'Poor Alston was mad, and spoke ten times to order'.
. . . . . whether, though Mr Alston should be thought an improper person, his brother Lt. Col. Alston, might not he thought a proper candidate by many of the Whig gentlemen, and the Dissenting interest in this county (which is not an inconsiderable one) I cannot take upon me to determine. Thomas Alston, who had separated from his wife by mutual consent two years after their marriage, died 18 July 1774, leaving all his property to Margaret Lee, his housekeeper, through whom it eventually descended to his illegitimate son Thomas. Ref The History of Parliament - House of Commons 1754-1790. After serving in the army Thomas Alston was returned unopposed as a Whig for the county in 1747 as a government supporter. The 2nd Lord Egmont's electoral survey c1749-50 notes on Bedfordshire: "Thomas Alston to continue---not an improper man he appears to have suffered from fits of insanity. In August 1752 he was confined in Duffield's madhouse upon very strong affidavits of absurdities he had been guilty of. He himself insisted he had been greatly heated of late by drinking and . . . . . that any extravagancies he might have been guilty of, were owing to that, and to that only, summoning everyone he knew in in town to come and declare his being in his right senses. He was released on expressing willingness to undergo treatment, but on the 15th Nov 1753 Richard Rigby (q.v.) reported to the Duke of Bedford "I hear among friends he has been in a bad way again lately". Another quote by Lord Egmont: "Thomas Alston was frequently not in any tolerable state of sanity even for Parliament"
Ref The History of Parliament - House of Commons 1715-1754. A letter dated 30 Sept 1803 signed R O (R Orlebar) to Thos Alston Esq conveyed to Alston the disapproval of the writer and others of the parish who were "in an uproar" at Alstons behaviour at a meeting convened for "finding a man to serve in the Army of reserve" the candidate was rejected by Alston "with scorn" but later "received with pleasure by Northamptonshire". R.O. writes further "I shall not presume to tell Magistrates or others how they are to act upon the present unfortunate occasion. but in an affair which gives (I shall be bold enough to say) universal dissatisfaction in Counties in general, as much case as possible ought to be administered to parishes . . . . . individuals instead of (pointedly) the reverse. A further letter by R.O. addressed only Sr. dated the 1 Oct 1803 refers to the incident and problems with funding and other matters concerning the Volunteer Corps and National Defence. Clapham of Harrold says Sir Rowland had two sons and one daughter Thomas, Rowland & Sarah. Thos. married a woman of family. That Sir Rowland left Odell Castle and went and resided at a little house in the neighbourhood. Some of the Family he have heard are buried at Strukson and Pavenham villages near, Mr. Grantham Rector says he believes Sir Rowland left the Estate to Sir Thos. during his life and if he died without issue then to his brother Rowland, which was the case. Sir Thos. Alston left Mrs. Margerett Lee Sole Executrix & Heiress, Sir Rowland the younger Brother and last of the Family dying without issue. Mrs Lee claimed the Odell Estate as a reversionary Estate, under the will of Sir Thos. Alston she being left sole Heiress. Miss Sarah Alston Sister to Sir Thos. married Dr. Pye Preband of Rochester by whom she had one Daughter who married Mr. Fitzherbert and died without issue. He says when Sir Rowland was in Possession of the Estate he cut down a quantity of timber of the estate in consequence of which Mrs. Margerett Lee brought an action which was tried at Westminster. Sir Rowland endeavoured to set aside his brothers Will by proving him insane but Mrs. Lee produced a letter written by him on the same date as the signature of the will, with an exactness for which in his rational moments he was particular. The case went against Sir Rowland, and was obliged to reinstate the value of the Timber amounting to about L500, tho' it was generally supposed had he moved it into the House of Lords he would have substantiated his claim. (Mottos in Arms) In Coelo Quies-Immotus. THE WILL OF SIR THOMAS ALSTON Bart. of ODELL. ln the name of God Amen. I Sir Thomas Alston of Odell in the County of Bedford Baronet being in perfect health and understanding do make this my last Will and Testament of and concerning all the estate and effects which I die possessed of or entitled to. In witness whereof I have here unto set my hand and seal this sixth day of September 1766. W. Myddelton, Thos. Orlebar Marsh. Proved at London a 21 November 1776 before the Worshipful Andrew Coltus Ducenal Doctor of Laws and Surrogate by the oath of Margaret Lee Spinster the Executrix to whom administration was granted having been first duly sworn to administer. A definitive sentence having been first pronounced and promulged for the validity of the Will as by the Acts of Court specified thereon appear.
. Ossory; Phil. Yorke esq. ; SIR ROWLAND ALSTON, Sir Danvers Osborn, barts. ; Thos. Bigge, Jn. Orlebar, Cuthbert Sheldon, Jn. Nodes, Talbot Williamson, Thos. Potter, THOMAS ALSTON, Paggen Hale, Jn. Bullock, Savile Cockayne Cust, Marshe Dickinson, Wm. Farrer, Harry Johnson, esqs. ; Phil. Birt, clerk; county j.p.s; Wm. Edwards, Robt. Butcher, Wm. Theed, Chas. Jackson, clerk; borough j.p.s; (iii) Thos. Woodward of Bedford; recites:- L.410 was raised by voluntary subscriptions of trustees and others for the area marked 'A' in sketch in margin; L.90 was paid by Thos. Woodward for areas 'B,B'; - area marked 'A', on trust to suffer buildings to be erected to be used by justices of assize, oyer & terminer & gaol delivery, & j.p.s for county and town, for assizes, and for quarter sessions (county & town), and for Bedford petty sessions; and such other lawful purposes as trustees at quarter sessions think fit; provided that the custos rotulorum and such persons as for the time being shall after the decease of John, Duke of Bedford, be his heir male and in possession of Woburn Abbey, be always of the number of the trustees; who shall be justices acting for the county and town; witn. Wm. Goldsmith, D. Jn. Mason. 11 June 1752. Conveyance (lease & release): 2 copies of each (i) Wm. Theed of Bedford, esq. (ii) Fra., Duke of Bedford; John, Earl of Ur. Ossory, custos; Sir Phil. Monoux, bart. ; Sam. Kettilby, D.D. ; Thos. Potter, Jn. Osborn, Jn. Miller, THOMAS ALSTON, Wm. Gery, Wm. Thornton Astell, Sam. Whitbread sr. & jr., esqs. ; Jn. Hawkins, Wm. Hooper, Edw. Tanqueray & Jas. Webster, clerks; acting j.p.s for the county; Jn. Gotobed & Wm. Belsham, esqs., acting J.P.s for town; recites 1/1; and that all trustees are dead except Wm. Theed; -- all that capital messuage or tenement, county hall or sessions house & residue of site included, marked 'A' in 1/1, in St. Paul's parish, on trust as before; same provision regarding trustees; with. Jer. Fish Palmer, Pet. Gardom, Thos. Kidman. 31 Jan., 1 Feb. 1796.